This is a pre-publication copy of an article that will appear in a volume entitled "God and Design," edited by Neil Manson and published by Routledge Press, that will appear early in 2003. I will add exact citation information to this web page when the volume is published. One of the things that makes science such an exhilarating activity is its revolutionary character. As science advances, there is always the possibility that some investigator, working in the field or at laboratory bench, will produce a discovery or experimental result that will completely transform our understanding of nature. The history of science includes so many examples of such discoveries that in many respects the practice of science has a built-in bias in favor of the little guy, the individual investigator who just might hold the key to our next fundamental scientific advance. Indeed, if there is one dogma in science, it should be that science has no dogma. What this means, as a practical matter, is that everything in science is open to question. Can we be sure that the speed of light isn't an absolute upper limit? Is it possible that genetic information can be carried by proteins, rather than DNA? Was Einstein correct in his formulation of the theory of general relativity? It's never easy to upset the scientific apple cart, but the practice of science requires, as an absolute, than everything in science be open to question. Everything. In 1996, Michael Behe took a bold step in this scientific tradition by challenging one of the most useful, productive, and fundamental concepts in all of biology  Charles Darwin's theory of evolution. Behe's provocative claim, carefully laid out in his book, Darwin's Black Box, was that whatever else Darwinian evolution can explain successfully, it cannot account for the biochemical complexity of the living cell. As Behe put it: "... for the Darwinian theory of evolution to be true, it has to account for the molecular structure of life. It is the purpose of this book to show that it does not" (Behe 1996a: 24-25). As we will see, Behe's argument is crafted around the existence of complex molecular machines found in all living cells. Such machines, he argues, could not have been produced by evolution, and therefore must be the products of intelligent design, a point of view he has articulated elsewhere in this volume. This argument has been picked up by a variety of anti-evolution groups around the United States, and has become a focal point for those who would argue that intelligent design theory deserves a place in the science classroom as a scientific alternative to Darwin. What I propose to do in this brief review is to put this line of reasoning to the test. I will examine both the scientific evidence for this claim and the logical structure of the biochemical argument from design, and will pose the most fundamental question one can ask of any scientific hypothesis  does it fit the facts? For nearly than a century and a half, one of the classic ways to argue against evolution has been to point to an exceptionally complex and intricate structure and then to challenge an evolutionist to "evolve this!" Examples of such challenges have included everything from the optical marvels of the human eye to the chemical defenses of the bombardier beetle. At first glance, Behe's examples seem to fit this tradition. As examples of cellular machinery for which no evolutionary explanations exist he cites the cilia and flagella that produce cell movement, the cascade of blood-clotting proteins, the systems that target proteins to specific sites within the cell, the production of antibodies by the immune system, and the intricacies of biosynthetic pathways. As he realizes, however, the mere existence of structures and pathways that have not yet been given step-by-step Darwinian explanation does not make much of a case against evolution. Critics of evolution have laid down such challenges before, only to seem them backfire when new scientific work provided exactly the evidence they had demanded. Behe himself once made a similar claim when he challenged evolutionists to produce transitional fossils linking the first fossil whales with their supposed land-based ancestors (Behe 1994: 61). Ironically, not one, not two, but three transitional species between whales and land-dwelling Eocene mammals had been discovered by the end of 1994 when his challenge was published (Gould 1994: 8-15). Given that the business of science is to provide and test explanations, the fact that there are a few things that have, as yet, no published evolutionary explanations is not much of an argument against Darwin. Rather, it means that the field is still active, vital, and filled with scientific challenges. Behe realizes this, and therefore his principal claim for design is quite different. He observes, quite correctly, that science has not explained the evolution of the bacterial flagellum, but then he goes one step further. No such explanation is even possible, according to Behe. Why? Because the flagellum has a characteristic that Behe calls "irreducible complexity." Since every part of the mousetrap must be in place before it is functional, this means that partial mousetraps, ones that are missing one or two parts, are useless  you cannot catch mice with them. Extending the analogy to irreducibly complex biochemical machines, they also are without function until all of their parts are assembled. What this means, of course, is that natural selection could not produce such machines gradually, one part at a time. They'd be non-functional until all of their parts were assembled, and natural selection, which can only select functioning systems, would have nothing to work with. Figure 1: According to the biochemical argument from design, natural selection could not produce an irreducibly complex biochemical machine because its individual parts are, by definition, without any selectable function. "There is no publication in the scientific literature  in prestigious journals, specialty journals, or books  that describes how molecular evolution of any real, complex, biochemical system either did occur or even might have occurred"(Behe 1996a:185). Powerful stuff. The great power of Behe's argument is that it claims to have discovered, in the biochemical machinery of the living cell, a new property (irreducible complexity) that makes it possible to rule out, even in principle, any possibility that evolution could have produced it. The next question we should ask is simple  is he right? If Behe's arguments have a familiar ring, they should. They mirror the classic "Argument from Design," articulated so well by William Paley nearly 200 years ago in his book Natural Theology. Darwin was well aware of the argument, so much so that he devoted special care to answering it when he wrote On The Origin of Species. Darwin's answer, in essence, was that evolution produces complex organs though a series of fully-functional intermediate stages. If each of the intermediate stages can be favored by natural selection, then so can the whole pathway. Is there something different about biochemistry, a reason why Darwin's answer would not apply to the molecular systems that Behe cites? In 1998, Siegfried Musser and Sunney Chan described the evolutionary development of the cytochrome c oxidase protein pump, a complex, multipart molecular machine that plays a key role in energy transformation by the cell. In human cells, the pump consists of six proteins, each of which is necessary for the pump to function properly. It would seem to be a perfect example of irreducible complexity. Take one part away from the pump, and it no longer works. And yet, these authors were able to produce, in impressive detail, "an evolutionary tree constructed using the notion that respiratory complexity and efficiency progressively increased throughout the evolutionary process" (Musser and Chan 1998: 517). How is this possible? If you believed Michael Behe's assertion that biochemical machines were irreducibly complex, you might never bother to check, and this is the real scientific danger of his ideas. Musser and Chan did check, and found that two of the six proteins in the proton pump were quite similar to a bacteria enzyme known as the cytochrome bo3 complex. Could this mean that part of the proton pump evolved from a working cytochrome bo3 complex? Certainly. An ancestral two-part cytochrome bo3 complex would have been fully functional, albeit in a different context, but that context would indeed have allowed natural selection to favor its evolution. How can we be sure that this "half" of the pump would be any good? By reference to modern organisms that have full, working versions of the cytochrome bo3 complex. Can we make the same argument for the rest of the pump? Well, it turns out that each of the pump's major parts is closely related to working protein complexes found in microorganisms. Evolution assembles complex biochemical machines, as Musser and Chan proposed, from smaller working assemblies that are adapted to fit novel functions. The multiple parts of complex biochemical machines are themselves assembled from smaller, working machines developed by natural selection, as shown in Figure 2. 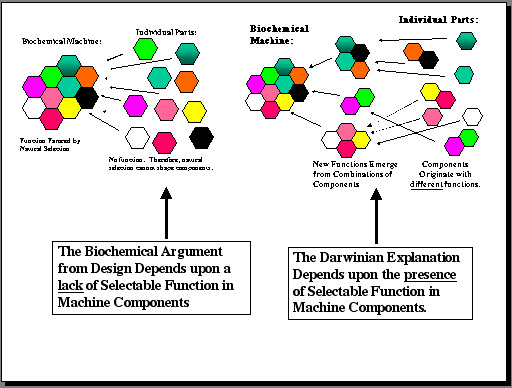 Figure 2: A Darwinian view of the evolution of complex biochemical machines requires that their individual parts and components have selectable functions. What of the statement that there is no publication anywhere describing how the "molecular evolution of any real, complex, biochemical system either did occur or even might have occurred?" Simply put, that statement is not correct. In 1996, Enrique Meléndez-Hevia and his colleagues published, in the Journal of Molecular Evolution, a paper entitled "The puzzle of the Krebs citric acid cycle: Assembling the pieces of chemically feasible reactions, and opportunism in the design of metabolic pathways during evolution." (Meléndez-Hevia et al 1996) The Krebs cycle is real, complex, and biochemical, and this paper does exactly what Behe says cannot be done, even in principle  it presents a feasible proposal for its evolution from simpler biochemical systems. This paper, as well a subsequent review of the Krebs Cycle by other authors (Huynen et al 1999), show that the scheme shown in Figure 2 is a perfectly adequate model to account for biochemical complexity. These are not isolated examples. Recently Martino Rizzotti published a series of detailed, step-by-step hypotheses for the evolution of a wide variety of cellular structures, including the bacterial flagellum and the eukaryotic cilium (Rizzotti 2000). I do not claim, even for a moment, that each and every one of Rizzotti 's explanations represent the final word on the evolution of these structures. Nonetheless, any validity one might have attached to the claim that the literature lacks such explanations vanishes upon inspection. What all of this means, of course, is that two principal claims of the intelligent design movement are disproved, namely that it is impossible to present a Darwinian explanation for the evolution of a complex biochemical system, and that no such papers appear in the scientific literature. It is possible, and such papers do exist. To fully explore the scientific basis of the biochemical argument from design, we should investigate the details of some of the very structures used in Behe's book as examples of irreducibly complex systems. One of these is the eukaryotic cilium, an intricate whip-like structure that produces movement in cells as diverse as green algae and human sperm. And, . . . .
"Just as a mousetrap does not work unless all of its constituent parts are present, ciliary motion simply does not exist in the absence of microtubules, connectors, and motors. Therefore we can conclude that the cilium is irreducibly complex" (Behe 1996a: 65). Remember Behe's statement that the removal of any one of the parts of an irreducibly complex system effectively causes the system to stop working? The cilium provides us with a perfect opportunity to test that assertion. If it is correct, then we should be unable to find examples of functional cilia anywhere in nature that lack the cilium's basic parts. Unfortunately for the argument, that is not the case. Nature presents many examples of fully-functional cilia that are missing key parts. One of the most compelling is the eel sperm flagellum (Figure 3), which lacks at least three important parts normally found in the cilium: the central doublet, central spokes, and the dynein outer arm (Wooley 1997). This leaves us with two points to consider: First, a wide variety of motile systems exist that are missing parts of this supposedly irreducibly complex structure; and second, biologists have known for years that each of the major components of the cilium, including proteins tubulin, dynein, and actin have distinct functions elsewhere in the cell that are unrelated to ciliary motion. Given these facts, what is one to make of the core argument of biochemical design  namely, that the parts of an irreducibly complex structure have no functions on their own? The key element of the claim was that: ".. any precursor to an irreducibly complex system that is missing a part is by definition nonfunctional." But the individual parts of the cilium, including tubulin, the motor protein dynein, and the contractile protein actin are fully-functional elsewhere in the cell. What this means, of course, is that a selectable function exists for each of the major parts of the cilium, and therefore that the argument is wrong. In many ways, the "poster child" for irreducible complexity has been the bacterial flagellum. The well-matched parts of this ion-driven rotary engine pose, in the view of many critics, an insurmountable challenge to Darwinian evolution. Once again, however, a close examination of this remarkable biochemical machine tells a quite different story. To begin with, there is more than one type of "bacterial flagellum." Flagella found in the archaebacteria are clearly not irreducibly complex. Recent research has shown that the flagellar proteins of these organisms are closely related to a group of cell surface proteins known as the Class IV pilins (Jarrel et al 1996) Since these proteins have a well-defined function that is not related to motility, the archael flagella fail the test of irreducible complexity. Clearly, when he speaks of the bacterial flagellum, Behe refers to flagella found in the eubacteria. Representations of eubacterial flagella appear in Darwin's Black Box (Behe 1996a: 71) and have been used by Dr. Behe in a number of public presentations. Surely these structures must fit the test of irreducible complexity? Ironically, they don't. In 1998 the flagella of eubacteria were discovered to be closely related to a non-motile cell membrane complex known as the Type III secretory apparatus (Heuck 1998) These complexes play a deadly role in the cytotoxic (cell-killing) activities of bacteria such as Yersinia pestis, the bacterium that causes bubonic plague. When these bacteria infect an organism, bacteria cells bind to host cells, and then pump toxins directly through the secretory apparatus into the host cytoplasm. Efforts to understand the deadly effects of these bacteria on their hosts led to molecular studies of the proteins in the Type III apparatus, and it quickly became apparent that at least 10 of them are homologous to proteins which form part of the base of the bacterial flagellum (Heuck 1998: 410). This means that a portion of the whip-like bacterial flagellum functions as the "syringe" that makes up the Type III secretory apparatus. In other words, a subset of the proteins of the flagellum is fully-functional in a completely different context  not motility, but the deadly delivery of toxins to a host cell. This observation falsifies the central claim of the biochemical argument from design  namely, that a subset of the parts of an irreducibly complex structure must be, "by definition nonfunctional." Here are 10 proteins from the flagellum which are missing not just one part but more than 40, and yet they are fully-functional in the Type III apparatus. If the biochemical argument from design is a scientific hypothesis, as its proponents claim, then it should make specific predictions which are testable in scientific terms. The most important prediction of the hypothesis of irreducible complexity is shown in Figure 4, and it is that components of irreducibly complex structures should not have functions that can be favored by natural selection. Figure 4: The biochemical argument from design makes a specific, testable prediction about the components of "irreducibly complex" structures. That prediction is that individual portions of such machines should not have selectable functions. The Darwinian explanation for such structures makes a contrary prediction  namely, that components of the machine should have such functions. The scientific literature provides more than enough evidence to distinguish between the two alternatives. As we have seen, a subset of the proteins from the flagellum does indeed have a selectable function in Type III secretion. 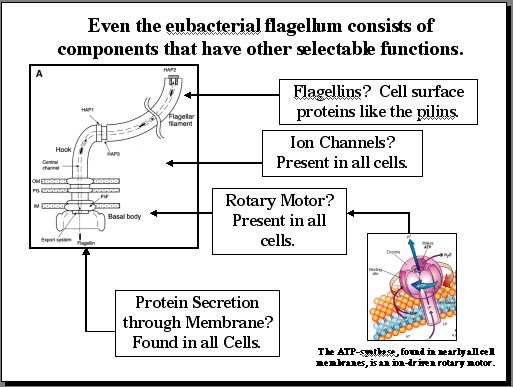 However, we can make a more general statement about many of the components of the eubacterial flagellum, as shown in Figure 5. Proteins that make up the flagellum itself are closely related to a variety of cell surface proteins, including the pilins found in a variety of bacteria. A portion of the flagellum functions as an ion channel, and ion channels are found in all bacterial cell membranes. Part of the flagellar base is functional in protein secretion, and once again, all bacteria possess membrane-bound protein secretory systems. Finally, the heart of the flagellum is an ion-driven rotary motor, a remarkable piece of protein machinery that converts ion movement into rotary movement that males flagellar movement possible. Surely this part of the flagellum must be unique? Not at all. All bacteria possess a membrane protein complex known as the ATP synthase which uses ion movements to produce ATP. How does the synthase work? It uses the energy of ion movements to produce rotary motion. In short, at least four key elements of the eubacterial flagellum have other selectable functions in the cell that are unrelated to motility. Figure 5: At least four components of the eubacterial flagellum have selectable functions that are unrelated to motility. These facts demonstrate that the one system most widely cited as the premier example of irreducible complexity contains individual parts that have selectable functions. What this means, in scientific terms, is that the hypothesis of irreducible complexity is falsified. The Darwinian explanation of complex systems, however, is supported by the same facts. One might, of course, raise the objection that I have not provided a detailed, step-by-step explanation of the evolution of the flagellum. Isn't such an explanation required to dispose of the biochemical argument from design? In a word, no. Not unless the argument has allowed itself to be reduced to a mere observation that an evolutionary explanation of the eubacterial flagellum has yet to be written. I would certainly agree with such a statement. However, the contention made by Behe is quite different from this  it is that evolution cannot explain the flagellum in principle (because its multiple components have no selectable function). By demonstrating the existence of such functions, even in just a handful of components, we have invalidated the argument. Figure 6: Alternate, selectable functions for partial assemblies of the five parts of a standard mousetrap. The numbers in brackets indicate the number of parts required for each function. For example, just one part (the hold-down bar) is required for a toothpick, three for a tie-clip (base, spring, and hammer), and a refrigerator clip can be fashioned from the same three parts by adding one additional part (a magnet). Behe has responded to these simpler mousetraps by pointing out, quite correctly, that human intervention and ingenuity are needed to construct the simpler mousetraps, and therefore they do not present anything approaching a model for the "evolution" of the five part trap. However, his response overlooks the crucial question. Are subsets of the five part trap useful (selectable) in different contexts? Along those lines, for my personal use I sometimes wear a tie clip consisting of just 3 parts (platform, spring, and hammer) and use a key chain consisting of just 2 (platform and hammer). It is possible, in fact, to imagine a host of uses for parts of the "irreducibly complex" mousetrap, some of which are listed in Figure 6. The meaning of this should be clear. If portions of a supposedly irreducibly complex mechanical structure are fully-functional in different contexts, then the central claim built upon this concept is incorrect. If bits and pieces of a machine are useful for different functions, it means that natural selection could indeed produce elements of a biochemical machine for different purposes. The mousetrap example provides, unintentionally, a perfect analogy for the way in which natural selection builds complex structures. The result of these cumulative efforts to investigate the cell  to investigate life at the molecular level  is a loud, clear, piercing cry of "design!" The result is so unambiguous and so significant that it must be ranked as one of the greatest achievements in the history of science. The discovery rivals those of Newton and Einstein, Lavoisier and Schrödinger, Pasteur, and Darwin" (Behe 1996a: 232-233). What is the "Evidence" for Design? 1) Observation: The cell contains Biochemical Machines in which the loss of a single component may abolish function. Definition: Such machines are therefore said to be "irreducibly complex." 2) Assertion: Any irreducibly complex structure that is missing a part is by definition non-functional, leaving natural selection with nothing to select for. 3) Conclusion: Therefore, irreducibly complex structures could not have been produced by natural selection. 4) Secondary Conclusion: Therefore, such structures must have been produced by another mechanism. Since the only credible alternate mechanism is intelligent design, the very existence of such structures must be evidence of intelligent design. Table I: The logical chain of reasoning leading from the observation of biochemical complexity to the conclusion of intelligent design. With the reasoning behind the biochemical argument from design is laid out in this way, it becomes easy to spot the logical flaw in the argument. The first statement is true  the cell does indeed contain any number of complex molecular machines in which the loss of a single part may affect function. However, the second statement, the assertion of non-functionality, is demonstrably false. As we have seen, the individual parts of many such machines do indeed have well-defined functions within the cell. Once this is realized, the logic of the argument collapses. If the assertion in the second statement is shown to be false, the chain of reasoning is broken and both conclusions are falsified. The cell does not contain biochemical evidence of design. Paley's 21st century followers claim that the intelligent design movement is based upon new discoveries in molecular biology, and represents a novel scientific movement that is worthy of scientific and educational attention. Couched in the modern language of biochemistry, Behe's formulation of Paley represents the best hopes of the movement establish its views as scientifically legitimate. As we have seen in this brief review, however, it is remarkably easy to answer each of his principal claims. This analysis shows that the "evidence" used by modern advocates of intelligent design to resurrect Paley's early 19th century arguments is neither novel nor new. Indeed, their only remaining claim against Darwin is that they cannot imagine how evolution might have produced such systems. Time and time again, other scientists, unpersuaded by such self-serving pessimism, have shown (and published) explanations to the contrary. When closely examined, even the particular molecular machines employed by the movement as examples of "irreducible complexity" turn out to be incorrect. Finally, the logic of the argument itself turns out to have an obvious and fatal flaw. I would suggest that the actual reason is much simpler. The scientific community has not embraced the explanation of design because it is quite clear, on the basis of the evidence, that it is wrong. M. J. Behe (1994) "Experimental support for regarding functional classes of proteins to be highly isolated from each other," in J. Buell and V. Hearn (eds.) Darwinism, Science or Philisophy? Houston, Texas: The Foundation for Thought and Ethics. M. J. Behe (1996a) Darwin's Black Box, New York, The Free Press. M. J. Behe (1998) "Intelligent Design Theory as a Tool for Analyzing Biochemical Systems," in Mere Creation, Downers Grove, IL, USA: InterVarsity Press. S. J. Gould (1994) "Hooking Leviathan By Its Past," Natural History May: 8-15. M. A. Huynen, T. Dandekar, and P. Bork (1999) "Variation and evolution of the citric acid cycle: a genomic perspective," Trends in Microbiology 7: 281-291. K. F. Jarrel , D. P. Bayley, and A. S. Kostyukova (1996) "The Archael Flagellum: a unique motility structure," J Bacteriol, 178, 5057-5064. S. M. Musser and S. I. Chan (1998) "Evolution of the cytochrome C oxidase proton pump," J. Molecular Evolution 46: 508-520. D. M. Wooley (1997) "Studies on the eel sperm flagellum," J. Cell Science 110: 85-94.